I was making this Chard & Herbed Ricotta Galette from Eating Well Magazine, when I heard from Rita she wouldn’t have time to post. We needed a new recipe to follow my Halloween post – gasp, it’s nearly Thanksgiving but retail tells us it’s Christmas!- so I thought of my posts about existing recipes. There are so many enticing recipes to try, why always re-create?! Of course, adding one’s own preferences or spin on a recipe is part of the fun, and tailors the food to our tastes. Or ingredients on-hand. Frozen kale instead of fresh chard (very handy when I’m not laden with big bunches of fresh greens from Riverdogfarm CSA). Whole milk instead of part-skim (I had an open container from another recipe which always bugs me as it usually goes bad). One large onion instead of two but how large is a ‘large’ onion anyway? My onion was 12 oz. or 3 cups sliced. The Handbook of Food Preparation says 1 lb = 3 large onions. I think it’s out of date Ask. com sounds more like it, 8 oz. for a medium onion. (so I was 1 onion short). I got to work, snapped some pictures while I cooked (yes, the family was patient), and also tested a pan liner called COOKINA®. (available on-line and at Home Depot) that was provided to me as a sample. Cookina liners replace parchment, foil and wax paper (reducing waste) and eliminate pan sprays (which I think can impart off flavor). COOKINA® liners are thin, sturdy, re-usable and easy to store rolled into the COOKINA® ring as shown in the photos. I also discovered the liners are great for rolling pie dough, which means an all new way to roll my short-cut pie crust and I’m very excited about that! Place a damp paper towel under Cookina sheet to prevent slipping. The galette dough transferred from counter to pan on the COOKINA® pan liner. SO EASY! 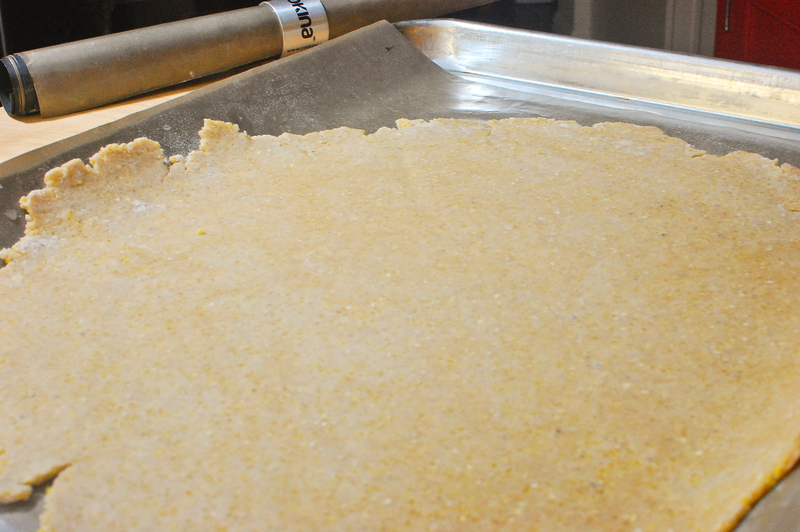 Fill and fold, right on the liner in the pan. Bake to golden brown. No mess on the pan. Easy-wash COOKINA® pan liner. The galette was enjoyed by my tasters (husband Bernie and daughter Anna Lai, home for Sunday dinner). 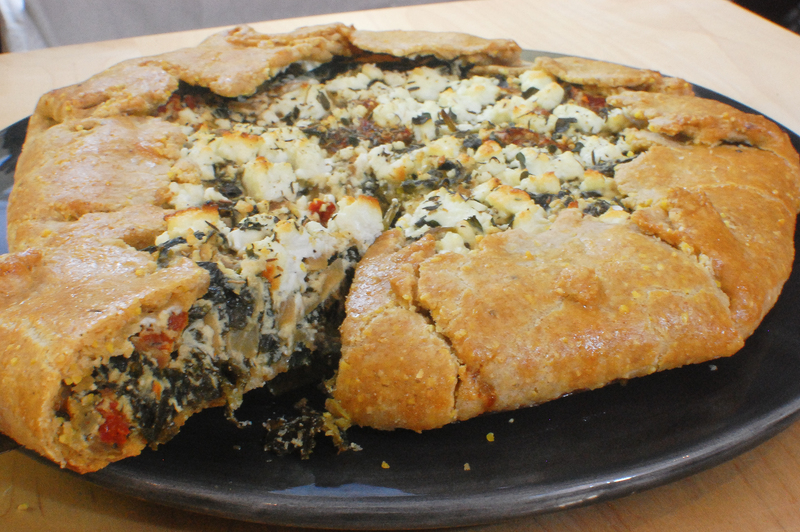 It is chock-full of cheeses and veggies, with a light and slightly crunchy cornmeal crust. Perfect for a simple vegetarian meal, and leftovers reheat easily in a toaster oven. Click here for the recipe in Eating Well Magazine. And to you kind readers who have read this far, what do you think about this more lengthy style of post? Rita and I have been blogging together for nearly 5 years with the motto of ‘less talk – simply recipes’ to share the many recipes we create for clients and ourselves. We realize there is plenty to read on the web and elsewhere in your life, and appreciate that you stop by GetCookingSimply. To let us know if you like this style or our ‘less-talk’ posts, or a variety, just click on the leave a comment link below to respond. Thank you! Well, I did read to the bottom of your galette commentary… however, I do like your more simple to the point style. That being said, as I read about your galette adventure, I enjoyed hearing your process. Maybe a monthly process-posting, that discusses how a recipe can vary and evolve depending on ingredients in the pantry. Happy Thanksgiving time, Betsy. Betsy – We really appreciate your viewpoint, and I think we are in the same camp — less talk, get to the recipe! And I’m soo glad to hear a recipe developer colleague can’t follow a recipe either. I heard a great interview with Bon Appetit editors years ago. They want their recipes to be inspiration, not necessarily followed. Except baked goods usually need some following. Love the galette and have a couple related questions. 1) Can I substitute SPINACH for kale? I prefer spinach and I’ve read it actually has more nutrients. Same proportions? 2) BUTTERNUT SQUASH | My Dreaded Wrestling Match – It’s that time of year. You know you could add some squash to this recipe – for color and a touch of sweetness. BUT there’s always those gosh-darned seeds and gunk in the middle that are very hard to scrape out prior to cooking. What’s the easiest way to PEEL and scrape out the messy bits? Maybe a <a href=http://thewimpyvegetarian.com/ title="Wimpy Vegetarian" could help? Hi John – Spinach might be a bit wet for this recipe, but hey, give it a try I bet it will work. As for the butternut, if you really hat the messy bits, buy a bag of cubed peeled squash which is available in most any produce department. Or, give Rita’s butternut squash directions a go . Let us know if it works for you! I appreciate simple direct, get me to the recipe already. That said, I did enjoy your ramblings. Good to hear you don’t blindly follow recipes, well, you probably do more than I, but I love to combine many to produce one. Tho’, I’ll bet you remember what you actually did and where. Terrific to hear, Joyce. Rita and I are the ‘get me to the recipe’ type too. I do remember recipes changes pretty well, but it’s much better if if I write them down, which I have to do for testing. I pay for it if I don’t! What a great idea, just my style. I always forget about savory galettes. I’m a whiz at fruit galettes! I like the chatty, long form recipe discussions; provides an opportunity to “teach” a little. I hadn’t heard of cookina? Sheets. I have some old roll up Teflon sheets which do the same thing. They are indispensable. 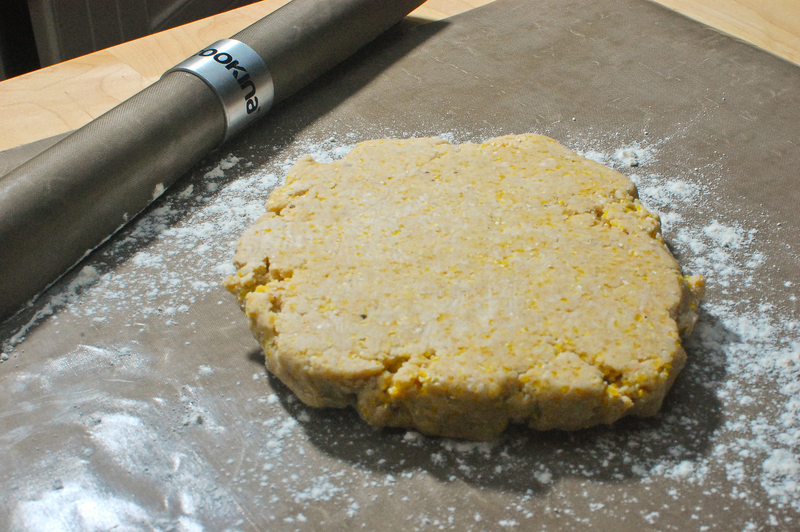 Great for crusts — one stop rolling and lifting into the pan, also for help in lifting the edges onto the filling. Think I’ll cook tonight. I have a tub of ricotta just looking for a dish to star in. Yes, you ARE the galette wiz! That’s neat you’ve been using your Teflon sheets. Looking forward to hearing how you like the savory galette. Hi, I made the tart for supper tonight, and it was wonderful. I used a large leek instead of onions. I also substituted semolina for the cornmeal. 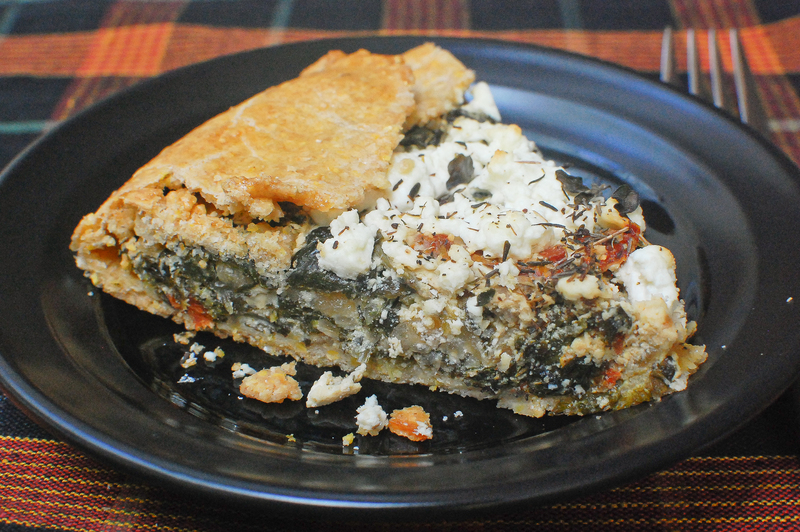 I forgot the goat cheese on top ( I was going to sub feta) and it was fine. Also, I used the entire 15 oz. tub of ricotta and both eggs in the filling. It set up perfectly, and it tasted delicious. Thanks for a great galette recipe. I loved this lengthier post. Gives me insight on how you think about food and your process – which helps me learn too. 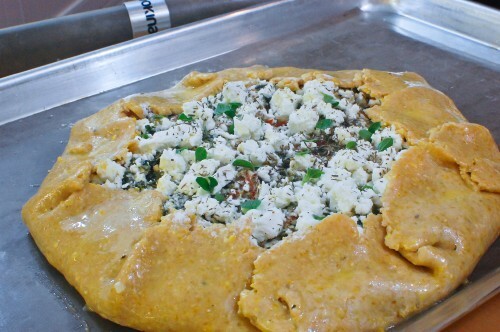 Plus it gets me more excited to make the galette. Yum! Thanks for letting me know! And I will look to learn about your Indian cooking on http://www.samoasajunkie.com!